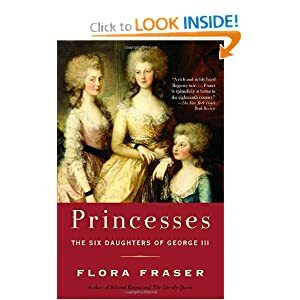 Princesses: The Six Daughters of George III by Flora Fraser is another one of my favourite books. King George III's six daughters tend to get short shrift from historians and biographers who focus on their father, their brothers, and their niece Queen Victoria. The prevailing picture of them is of six retiring women in the background. This book has pulled Charlotte, Augusta, Elizabeth, Mary, Sophia, and Amelia out of the shadows and let us see that they had strong personalities and lives of their own. This is an extremely well written book, on the face of it, a book that covers women who were extremely sheltered and restricted wouldn't be interesting. But they managed to have full lives, and it does make for good reading. This is another one of my books that I have read over and over again.